Here is my project for the challenge over at Creative Moments. 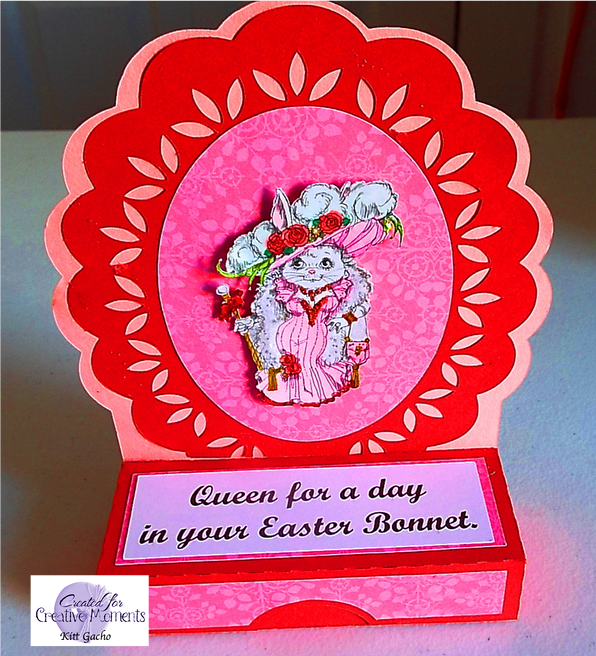 I used Stickle diamonds on the fur scepter and jewels on the Bunny. Unfortunately, they don't show up well in the photo. I put the bunny on pop dots and I used my new chameleon markers to color her. The image is from RSD. The box tag box is from the Silhouette Store Design ID #67658 Be sure to stop by and see what the DT has for your inspiration and join in the fun for a chance to win some digital images. Thanks for stopping by today and leaving your comments. I will have more 3D projects coming soon. Thank you very much for entering the "Dragons Lair Designs" "Add an Animal" challenge this month. Good luck. A lovely card and a clever design. Thanks for joining us at Pattie's Creations Challenge.